This is one of the first ukiyo-e dedicated to the memory of an actor, namely to Ichikawa Danjūrō VI (1778–1799) who died at a young age. On the left, apparently emulating Danjūrō’s own handwriting, is his death poem: “Over the mountains, / over streams and rivers he flies, / the cuckoo.” Kawa (river) is part of the name Ichikawa. The Japanese cuckoo hototogisu is associated with death and the journey of the soul. Tragedy seemed to stalk the celebrated Ichikawa family of actors, especially those who held the foremost name of Danjūrō, after being awarded by the government for his filial devotion, committed suicide shortly after rejoining his father in Ōsaka after the elder man had been exiled from Edo for violations of the sumptuary laws. In 1791, Danjūrō V, the leading actor of his day, bequeathed his name to his teen-age son, and a few years afterwards retired from the stage. In 1799, at the age of 22, however, his young son suddenly died. His aged father was heartbroken, but agreed to come out of his retirement for a few last performances. Kunimasa print is one of the first memorial portraits of actors, a genre of woodblock print that became very popular in the first half of the 19th century, culminating in the dozens of prints that were published for the inexplicable suicide of Danjūrō VIII. 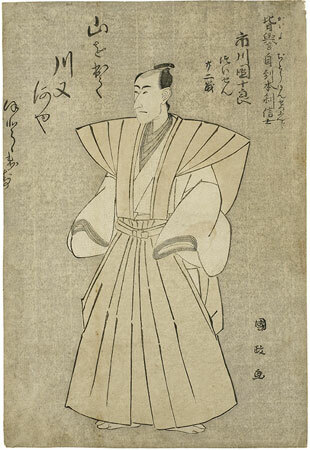 Kunimasa print establishes the conventional format for the prints: a full length portrait in formal attire, the actor’s name, and his posthumous Buddhist name, Kaiyo Jitō Honsetsu Shinji. Instead of a date, the inscription says he died at 22 years of age. At the right is a poem suggested to have been composed by the actor on his death bed. Kawa, or river, is the second character of the name Ichikawa. The hototogisu, a kind of cuckoo, is associated with death and the passage of the soul. Reproduced in: Ingelheim catalogue, no. 90a.